Fire in the Moor: Mesolithic Carbonised Remains in Riverine Deposits at Gleann Mor Barabhais, Lewis, Western Isles of Scotland Stephanie F. Piper1, *, Rosie R. Bishop1,2, Peter A. Rowley-Conwy1, Lorne Elliott1, and Mike J. Church1 Abstract – This paper presents the results of a palaeoenvironmental investigation of riverine deposits containing charred heathland plant material, recovered during an archaeological survey of Gleann Mor Barabhais, Lewis, Western Isles of Scotland. This survey was conducted to identify Mesolithic occupation in the interior of the island and was undertaken as part of a wider project investigating the Mesolithic of the Western Isles. The recovery of carbonised material of Mesolithic date is discussed in light of the long-standing debate on detecting hunter-gatherer impact on environments using palaeoenvironmental records. The findings are compared to regional pollen sequences, where peaks in micro-charcoal levels and associated reductions in arboreal pollen are interpreted as evidence for anthropogenic fire ecology. These have been identified in areas where archaeological evidence for human occupation is absent. It is argued that this site reflects deliberate burning of vegetation by humans, most likely a small hearth, and therefore represents the first direct inferred evidence for the Mesolithic in the interior of the Western Isles. 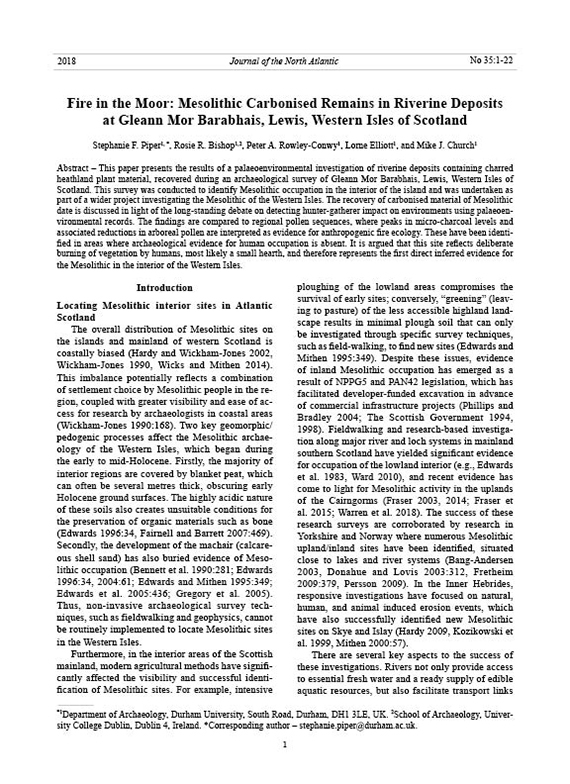 Introduction Locating Mesolithic interior sites in Atlantic Scotland The overall distribution of Mesolithic sites on the islands and mainland of western Scotland is coastally biased (Hardy and Wickham-Jones 2002, Wickham-Jones 1990, Wicks and Mithen 2014). This imbalance potentially reflects a combination of settlement choice by Mesolithic people in the region, coupled with greater visibility and ease of access for research by archaeologists in coastal areas (Wickham-Jones 1990:168). Two key geomorphic/pedogenic processes affect the Mesolithic archaeology of the Western Isles, which began during the early to mid-Holocene. Firstly, the majority of interior regions are covered by blanket peat, which can often be several metres thick, obscuring early Holocene ground surfaces. The highly acidic nature of these soils also creates unsuitable conditions for the preservation of organic materials such as bone (Edwards 1996:34, Fairnell and Barrett 2007:469). Secondly, the development of the machair (calcareous shell sand) has also buried evidence of Mesolithic occupation (Bennett et al. 1990:281; Edwards 1996:34, 2004:61; Edwards and Mithen 1995:349; Edwards et al. 2005:436; Gregory et al. 2005). Thus, non-invasive archaeological survey techniques, such as fieldwalking and geophysics, cannot be routinely implemented to locate Mesolithic sites in the Western Isles. Furthermore, in the interior areas of the Scottish mainland, modern agricultural methods have significantly affected the visibility and successful identification of Mesolithic sites. For example, intensive ploughing of the lowland areas compromises the survival of early sites; conversely, “greening” (leaving to pasture) of the less accessible highland landscape results in minimal plough soil that can only be investigated through specific survey techniques, such as field-walking, to find new sites (Edwards and Mithen 1995:349). Despite these issues, evidence of inland Mesolithic occupation has emerged as a result of NPPG5 and PAN42 legislation, which has facilitated developer-funded excavation in advance of commercial infrastructure projects (Phillips and Bradley 2004; The Scottish Government 1994, 1998). Fieldwalking and research-based investigation along major river and loch systems in mainland southern Scotland have yielded significant evidence for occupation of the lowland interior (e.g., Edwards et al. 1983, Ward 2010), and recent evidence has come to light for Mesolithic activity in the uplands of the Cairngorms (Fraser 2003, 2014; Fraser et al. 2015; Warren et al. 2018). The success of these research surveys are corroborated by research in Yorkshire and Norway where numerous Mesolithic upland/inland sites have been identified, situated close to lakes and river systems (Bang-Andersen 2003, Donahue and Lovis 2003:312, Fretheim 2009:379, Persson 2009). In the Inner Hebrides, responsive investigations have focused on natural, human, and animal induced erosion events, which have also successfully identified new Mesolithic sites on Skye and Islay (Hardy 2009, Kozikowski et al. 1999, Mithen 2000:57). There are several key aspects to the success of these investigations. Rivers not only provide access to essential fresh water and a ready supply of edible aquatic resources, but also facilitate transport links and are likely to have functioned as inter-connecting route-ways through the interior during the Mesolithic, making them prime locations for hunter-gatherer occupation (Bonsall et al. 2009:71, Edwards et al. 1983, Ward 2010:3, Warren 2005:63). The erosive fluvial processes of these rivers over millennia has produced natural transects through the mid- to late-Holocene peat development, exposing relic ground surfaces in section (Wickham-Jones and Firth 2000:123). As a consequence of the unfavourable preservation conditions for organic material, lithic debris and carbonised plant material are frequently the only surviving Mesolithic cultural evidence recovered from inland sites in Scotland. It is these ephemeral assemblages that have been recovered from the eroding sections of loch edges or river banks (Affleck 1984a, 1984b; Ansell 1968, 1969). The presence of lithics undeniably attests to human presence, whereas carbonised plant material may result from anthropogenic activities or natural events (cf. Edwards 1996, Tipping 1996). The recovery of carbonised plant material however, provides necessary dating evidence for these sites. Recently, conclusive evidence for Mesolithic occupation in the Western Isles confirmed that hunter-gatherers had reached this most westerly point of north-west Europe a little after 8000 B.P. (Gregory et al. 2005). Two site types have been identified by a sustained programme of field survey and targeted excavation by a team from Durham University: open palimpsests of occupation material within the mid-Holocene ground surface of the Toe Head peninsula in Harris (Bishop et al. 2011, Church et al. 2012a), and open air shell middens on the Bhaltos Peninsula, Lewis (Bishop et al. 2013a, Church and Rowley-Conwy 2013, Church et al. 2012b, Snape-Kennedy et al. 2013). In both areas, the Mesolithic sites were discovered in coastal erosion sections, an important method of site identification in North Atlantic archaeology (cf. Church et al. 2005, 2013). In light of the surveys that have successfully identified Mesolithic sites in fluvial environments in the interior of mainland Scotland, and in coastal erosion sections in the Western Isles, an archaeological survey was conducted along the longest river in the Isle of Lewis (Welcome to Scotland 2018). The main research questions this survey aimed to address were: • Which major periods did the archaeological sites identified in the river survey represent? • Can Mesolithic archaeological sites be identified in the interior of the Western Isles through targeted surveying of eroding fluvial environments? The principal aim of the fieldwork was to test whether the survey could be used to identify activity of Mesolithic date in the interior of the island. If this methodology was successful, the results would have significant implications for understanding hunter-gatherer activities in these islands, expanding the known range of hunter-gatherer occupations beyond coastal settlements, into the interior, and would show whether or not the method has further potential for identifying inland hunter-gatherer sites. Methods Survey A desk-based assessment was conducted to identify a low-energy river system within a wide, shallow valley. This type of river system is relatively stable, with high rates of vertical fine-grained sediment accretion and minimal incisive erosion that leads to post-depositional mixing (Howard and Macklin 1999). The stability of low-energy river systems provides the greatest potential for preservation of in situ archaeological remains. Gleann Mor Barabhais is the longest river in Lewis, which penetrates ca. 10 km into the island’s interior, and was selected as the most promising area to survey based on its geomorphic position. Furthermore, historical and modern fishing accounts attest to the abundance of salmon in the river, which would have no doubt attracted Mesolithic hunter-gatherer-fishers (Fish Hebrides 2018, MacRae 1836, Martin 1703). The locations and details of all previously recorded archaeological sites within a 10 m radius of the river were obtained from Historic Environment Scotland’s online database CANMORE, although these solely comprised post-Medieval structures (see Appendix 1). A walk-over survey was conducted over ten days during September 2013. Both banks of Gleann Mor Barabhais and a substantial tributary of the river along Gleann Airigh na Gile were surveyed during this time. There were numerous fresh erosion scars from bank collapse that were inspected, owing to recent high river levels. All visible archaeological features within this vicinity of the river were recorded, regardless of age. Eroding sections of the river bank were closely examined for material that may indicate Mesolithic activity (Figs. 1, 2). Archaeological deposits containing Mesolithic material were expected to be situated below the peat and above glacial till. This was the most likely stratigraphic position for sites of this age, because all of the Mesolithic sites that have so far been identified in the Western Isles have been situated in this stratigraphic position. Whilst some peat may have begun to develop as early as the Mesolithic in some areas, widespread accelerated peat development did not begin in this region until the late Neolithic (Fossitt 1996). A handheld GPS was used in conjunction with an Ordnance Survey Landranger map (1:50,000 scale) to record the location of sites. Excavation Only a single section of the riverbank was identified as likely evidence for pre-Medieval activity (Site Code = DLS’13 #30; NGR NB37464648; Piper et al. 2013, 2014). The section was cleaned, photographed and recorded using standard single context recording (Fig. 3). An illustration of the section identifying the different stratigraphic units was drawn at 1:10 (Fig. 4). Two column samples (Sample 1 and Sample 2; S.1 and S.2 hereafter) were taken from the eroding section to provide detailed site-formation information (Macphail et al. 1990), and a single bulk sample of ca. 3.5 litres (Sample 3; S.3 hereafter) was also excavated to ensure the recovery of environmental remains (Jones 1991). The column samples were wrapped in cling-film and placed in sealed bags for transportation to the Environmental Laboratories at the Department of Archaeology, Durham University. The samples were kept in cold storage (4° C) prior to laboratory analysis. Bulk sample processing The bulk sample was sub-sampled for loss-on-ignition and magnetic susceptibility analysis, prior to bucket flotation by hand to recover artefacts and ecofacts (Kenward et al. 1980). The flot was caught by 1 mm and 0.5 mm mesh sieves and a 1 mm mesh sieve retained the residue. Both the flots and residue were dried in a drying cabinet at 40° C, before being fractioned using 4 mm, 2 mm and 1 mm geological test sieves. All palaeobotanical material was recovered using a Leica M80 stereo microscope at 7.5–60x magnification. Palaeobotanical analysis Charcoal was only extracted from the >4 mm fraction due to difficulties in identifying fragments below this size (Pearsall 2000). The identification of wood species was conducted by examining the transverse, radial and tangential sections at up to 600x magnification, using a Leica DMLM stereo microscope. The identification of plant macrofossils was aided by modern reference material held in the Department of Archaeology, Durham University. Nomenclature follows Stace (2010). Sedimentary analysis Sedimentary analysis was undertaken on a 5 ml sub-sample of the bulk sample (S.3) and at 1 cm increments for each of the column samples (S.1 and S.2). Basic descriptions of the physical characteristics of each sample were recorded comprising soil texture, following DEFRA guidelines (2006), and colour which was estimated using a Munsell colour chart (Fig. 5). Mineral magnetic analysis was conducted on 1 cm3 sub-samples using a Bartington MS2G Single Frequency Sensor with the volume specific magnetic susceptibility (klf) calculated following Dearing (1994). Sequential loss-on-ignition was conducted on 1 cm³ sub-samples following Heiri et al. (2001). Results Survey results A total of thirty features were recorded during the survey of Gleann Mor Barabhais, seven of which had been previously identified and were present in the NMR (CANMORE). Three sites detailed in the NMR which fell within the survey area were not located during the investigation, and others differ substantially from the records held. Twenty-nine of the sites most likely date between the Medieval and modern periods. These included lazy beds, shielings and earthworks (often in association with one another). Walls built to stabilise the river banks were also recorded (Appendix 1). Excavation results Of the thirty recorded sites, only a single feature (DLS’13 #30) displayed evidence for potential early anthropogenic activity of the type the survey was designed to locate (Fig. 1; Piper et al. 2013, 2014). A ca. 6 cm deposit of dark brown/black silty-clay with charcoal flecks was identified overlying a thin layer of grey clay and well-sorted gravel, and was in turn overlain by series of alluvial laminations (Fig. 4). The deposit was visible for ca. 5 m along an eroding section of the river bank. A 0.95 m stretch of the section was cleaned and targeted for bulk-sampling for the recovery of archaeological material (S.3, Fig. 4). No archaeological features were detected during sampling of the deposit and no artefacts or faunal material was recovered. The deposit is present between 0–7.2 cm in depth in S.1, and 2.6–9 cm in depth in S.2 (Fig. 5). Botanical and sedimentary analysis Eleven pieces of small deciduous roundwood charcoal were recovered from the 4 mm residue fraction of DLS’13 #30 (Table 1). The charcoal was very poorly preserved, with post-depositional iron-oxide mineral deposits largely obscuring diagnostic features, precluding the recording of age and size data. Despite this, the fragments were positively identified as heather (Calluna vulgaris (L.) Hull) based on the diffuse pore arrangement and the fact the largest of these pores appeared in the upper third of a single growth year (Hather 2000, Schweingruber 1990). Additionally, the sample contained the charred remains of wet heathland species including a single seed of Bearberry (Arctostaphylos uva-ursi L. Spreng. ), culm nodes and a culm base of grass-type (Poaceae spp. ), two rhizomes and an abundance of sclerotia (resting bodies) of Cenococcum geophilum. The band of silty clay loam sampled for potential archaeological evidence has a high organic content (56–65%), with magnetic susceptibility ranging from slightly negative to extremely low and positive (Fig. 6). This contrasts to the overlying alluvium, which is very low in organic content (10–30%), and has slightly elevated levels of magnetic susceptibility. In the underlying thin band of grey clay the percentage of organic content is equal to that of the overlying alluvium and the level of magnetic susceptibility peaks, although is still low. There is virtually no organic content (<10%) in the basal gravel layer and the magnetic susceptibility is very low (Fig. 6). Magnetic susceptibility and loss-on-ignition could not be conducted between 9–9.4 cm in S.1 as the layer is heavy in stone inclusions and not enough material could be recovered for analysis. The lack of magnetic enhancement of these layers, compared against the mineral magnetic values for different sediments already established for the region (Church et al. 2007; Peters et al. 2000, 2004), and the sedimentary context of the material, indicates that burning did not occur in situ (Dearing 1994). Radiocarbon dating A single fragment of heather roundwood charcoal (Calluna vulgaris (L.) Hull) was submitted for single entity AMS radiocarbon dating at the Scottish Universities Environmental Research Centre (SUERC). Calibration of the date was conducted using OxCal 4.1.7 (Bronk Ramsey et al. 2010), with atmospheric data derived from Reimer et al. (2013). This charcoal fragment was dated, at 95.4% probability, to 4460–4355 cal. BC (5583±27 BP, SUERC-55370, Fig. 7). The information reported here follows the reporting recommendations for radiocarbon dates as proposed by Millard (2014). Discussion Inspection of the eroding banks of Gleann Mor Barabhais and its immediate environment successfully identified a range of evidence for anthropogenic activities of varying ages, but principally dating to the Medieval to post-Medieval periods (Appendix 1). The one exception to this was the deposition event at DLS’13 #30, which was radiocarbon dated to 4460–4355 cal. BC. This places this burning event within the Late Mesolithic of Scotland (Ashmore 2004), and within the current range for known Mesolithic occupation along the coast of Lewis (Church et al. 2012b). The identification of this Mesolithic material during the survey was significant because it provided the opportunity to investigate an area of “fine grained sedimentation in which archaeology is unlikely to be located through conventional archaeological prospection techniques” (Howard and Macklin 1999). However, as no archaeological features or artefacts were recovered from the sampled area, there is no definite evidence for human activity. Combined with the clear evidence for redeposition, this cannot legitimately be described as an archaeological site. Despite this, the accumulation of charred botanical material is valuable in reconstructing the palaeoenvironment around this area of Gleann Mor Barabhais. The carbonised plant material itself may derive from either a natural or anthropogenic fire event, the arguments for which are discussed below. Fire in Gleann Mor Barabhais Sedimentary analysis of the samples taken from DLS’13 #30 indicates that the site comprises a series of silty-clay alluvial laminations. The laminated nature of the stratigraphy and low magnetic susceptibility demonstrate that the material was not burnt in situ, but was re-deposited in a flood event, away from the original area of burning (Nichols et al. 2000, Scott et al. 2000). The date of 4460–4355 cal. BC from the charcoal provides a terminus post quem for the aggradation of this floodplain deposit, which is high in organic content, and suggestive of upstream erosion of moorland soils. The effects of burning events on soil stability, principally causing an increased susceptibility of soils to water runoff and erosion, are well documented (i.e., Fox et al. 2007, Kutiel et al. 1995, Mataix-Solera et al. 2011, Yoder 1936). The sampled area is situated ca. 5 km inland from the present coastline (Fig. 1), and during this time, the sea level would have been as much as 5 m lower than today (Jordan et al. 2010:131; Ritchie 1979, 1985:174-175). The material is likely to have originated from a geomorphic catchment which extends a minimum of 7 km further up-river and may be as much as 10 km wide, assuming the material was fluvially re-deposited by the Barabhais river or one of its tributaries in the surrounding area (Fig. 8). Despite this potentially wide catchment area, the charred plant macrofossils may be of relatively local origin, perhaps deriving from an area of heathland within the immediate vicinity of the excavated area. Therefore, the source of the material must have been within the interior of Lewis. To summarise, it can be reasonably inferred that: •	a fire event occurred within the interior of Lewis, a landscape which comprised areas of heathland; •	the fire event occurred upstream of DLS’13 #30, within a potential catchment area of the Barabhais river that extends over 36.5 km2 (Fig. 8); •	aggregate instability in the surrounding landscape led to soil erosion and runoff during a period of rainfall or flooding, which contained both sediment and charred plant macrofossils from this fire; •	the material carried by the runoff was redeposited during one or more low-energy hydrological events as the downstream floodplain accreted; •	this re-deposition episode may have been contemporary with, or post-date, the Late Mesolithic period, when the charred remains were produced. The palaeoenvironmental evidence from DLS’13 #30 provides a very small snapshot of an open heathland area in inland Lewis. The plant macrofossil assemblage is on a macro scale, in contrast to traditional palaeoenvironmental evidence from the Western Isles, which has been based upon pollen diagrams derived from palaeoenvironmental cores. These data are extrapolated from peaks in micro-charcoal—“low-level background rain of carbonised particles” (Innes and Simmons 2000)—deriving from mainly off-site burning (e.g., Birks and Madsen 1979, Bohncke 1988, Brayshay and Edwards 1996, Edwards 1990, Edwards et al. 1995, Fossitt 1996, Lomax 1997, Tipping 1996). Specifically, evidence for the Mesolithic flora of the Lewisian landscape is present in pollen diagrams from Callanish-3, Loch Builaval Beag and Loch na Beinne Bige, ca. 20 kilometres away from Gleann Mor Barabhais (Bohncke 1988, Fossitt 1996, Lomax 1997). These indicate that heathland only contributed to a very small proportion of total land pollen in the area at this time, although local expansions in Calluna heathland are recorded at Loch Builaval Beag and Callanish-3 between ca. 8400–7900 B.P. (Edwards 1996, Tipping 1996). It is likely, therefore, that the immediate landscape of these locales comprised heathland areas within a largely wooded environment (Bohncke 1988, Fossitt 1996, Fyfe 2007, Lomax 1997). Further south, the pollen sequence from Little Loch Roag indicates that this area of western Lewis was predominantly open heath and grassland (Birks and Madsen 1979). Heather is tolerant of a wide-range of moisture conditions—from heathland mor humus or peat bog, to the open birch woodland environments—that are well represented in the pollen diagrams from Lewis (Edwards 1996, Simmons 1996:108). The presence of the heather and Bearberry remains suggests that the upstream catchment of Gleann Mor Barabhais comprised an open heathland environment, potentially with early bog formation (Stace 2010). However, there is a clear need for a new pollen sequence to be produced for the interior of Barabhais Moor, which specifically assesses the nature and chronology of the Holocene blanket bog and heathland development, in order to test this further. Investigating the evolution of fluvial environments in the Western Isles also requires attention, given the lack of data from this region (i.e., Johnstone et al. 2006, Macklin et al. 2010). Fire ecology in Mesolithic moorlands? The plant macrofossil assemblage recovered from the deposits at DLS’13 #30 comprised a quantity of heather charcoal, in addition to charred rhizomes, culm nodes and culm bases of grasses, and fungal sclerotia. The relatively small area and concentrated nature of the charred deposit suggests that the charred macrofossils were derived from a small-scale burning event, such as a domestic hearth. Together, the species identified are recognised as archaeologically characteristic of burnt peat or turf (Hall 2003). The heather may have been collected separately as fuel for a small hearth, or the assemblage may have derived from the localised burning of peat or turf as fuel (Church et al. 2007). The burning of peat/turf for fuel is well documented in the Western and Northern Isles, as well as other islands of the North Atlantic, from the Neolithic to modern times (Bishop et al. 2009, 2013b, 2014, 2015; Bond 2007a, 2007b; Church 2002; Church et al. 2005, 2007; Dickson 1998; 1999; Smith 1999), and the Bronze Age in England (Branigan et al. 2002). There is little evidence for the burning of turf in the Mesolithic however. It has been suggested that that incorporation of charred tubers of lesser celandine (Ranunculus ficaria L.) within the Mesolithic deposits at Staosnaig, Colonsay may have been due to the burning of turf, rather than collected for human consumption (cf. Mithen et al. 2000). Turves may have also have been used in a domestic hearth or as part of a structure used for smoking or drying food at the Mesolithic site of Northton, Isle of Harris (Bishop 2013). Potential evidence for Mesolithic anthropogenic burning of the landscape on a larger scale (beyond small-scale burning in domestic hearths) has been identified in the palaeoenvironmental record. There is an abundance of evidence for Mesolithic-age fire incidence connected with disturbance phases in local vegetation cover throughout Britain, particularly in the Pennine region (e.g., Albert and Innes 2015; Blackford et al. 2006; Caseldine 1999; Caseldine and Hatton 1993; Innes and Blackford 2003, 2009; Innes et al. 2010, 2011, 2013; Innes and Simmons 2000; Ryan and Blackford 2010; Zvelebil 1994). Largely, these studies have focused on the effects of deforestation through human agency as deliberate land-management strategies designed to promote open areas of newly regenerating woodland which would increase browsing opportunities, and thus the predictability and productivity of large terrestrial herbivores (e.g., Clarke 1976, Dimbleby 1962, Edwards 1990, Innes and Blackford 2003, Jacobi et al. 1976, Simmons 2001:46, Simmons and Innes 1987, Zvelebil 1994); in addition to increasing yields from edible plant species, including hazel (Bishop et al. 2014, 2015; Mellars 1976; cf. Warren et al. 2014 on the Irish evidence). Mesolithic-age human impact on the environment in terms of vegetation disturbance has also been recorded within the islands of the Inner Hebrides, such as Kinloch, Rum (Hirons and Edwards 1990); Loch a’Bhogaidh, Islay (Edwards and Berridge 1994); and Auchareoch, Arran (Affleck et al. 1988), during periods of archaeologically corroborated Mesolithic occupation of these islands. In such instances, this evidence is interpreted as deliberate land management strategies by hunter-gatherers. There are, however, few studies discussing Mesolithic fire incidence in open areas such as heathland. Analysis of a number of cores taken from intertidal peats along the west coast of South Uist have indicated burning episodes associated with Calluna heathland during the Late Mesolithic (Ballantyne and Ward 2008, Bennett et al. 1990, Edwards 1996:34, Edwards et al. 1995, Mulder 1999, Simmons 1996:158), but as yet, there is no archaeological evidence for a Mesolithic presence on South Uist. Evidence for human impact on the landscape involving fire has also been inferred from North Locheynort, Loch an t-Sil, Reineval, and Borve on Benbecula at this time (Brayshay and Edwards 1996, Edwards 1990, Edwards et al. 1995, Whittington and Edwards 1997). Conversely, the archaeological record supports interpretations of fire ecology by way of heathland management during the Mesolithic in England (Caseldine and Hatton 1993, Simmons 2001), Wales (Fyfe 2007, Smith and Cloutman 1988), and Norway (Hjelle et al. 2010, Prøsch-Danielsen and Simonsen 2000). It is notable that Calluna is “… readily inflammable in many stages of its growth and under most likely weather conditions” (Simmons 1996:122). Experimental, simulated burning of heathland has indicated that controlled burning can improve the regeneration of Calluna (Whittaker and Gimingham 1962); moreover, continued burning of moorland would be necessary to some extent to maintain clearings (Mighall et al. 2008:625). The maximum conceivable catchment from which this assemblage derives is over 36.5 km2 (Fig. 8), based on the modern topography and river systems. Whilst the spatial extent of the deposit is not known beyond the dimensions recorded in section, it is probable that the charred palaeoenvironmental material that accumulated within this floodplain deposit is derived from a much more localised area. This is based upon the relatively discrete area of the deposit itself, which is high in organic content and with fine laminations, which suggests a slow accumulation rate (Greenwood 1991, Tipping and Halliday 1994, Warner 1988). The presence of macroscopic heather charcoal, which waterlogs very quickly, in combination with much smaller and less robust material (i.e., culm nodes and rhizomes) suggests that there has been minimal dispersal or winnowing of the material (Blackford 2000, Clark and Patterson 1997, Scott et al. 2000, Warner 1988). Consequently, it appears that the small quantity of the carbonised material recovered at DLS’13 #30 reflects small-scale low intensity burning on a localised level, potentially within less than 500 m from the sampled area, rather than widespread landscape-level burning resulting from deliberate management strategies (Froyd 2006, Ohlson and Tryterud 2000, Pitkänen et al. 1999, Whitlock and Larsen 2001). Openness in Mesolithic environments: natural or anthropogenic? It is generally agreed amongst palaeoecologists that open areas would have occurred within Mesolithic woodland ecosystems as a consequence of natural factors such as disease or environmentally-induced dieback, fire, wind throw, and senescence, thus facilitating heathland development (Bradshaw et al. 2003, Brown 1997, Edwards and Whittington 2003, Peterken 1996, Svenning 2002, Tipping 1994). However, there are also two popular models which are frequently cited with regard to the presence of open areas in the Mesolithic landscape. The “wood pasture” model (Vera 2000) proposes a patch-work of woodland and pasture “maintained by large herbivore grazing regimes” (Fyfe 2007). The second “high-forest” model, proposed by Peterken (1996), favours a closed-canopy landscape with some open areas. Bradshaw et al. (2003) argue that in both models “dense populations” of large ungulates are necessary in maintaining these areas of openness. It should be stressed that in this instance, these models cannot be applied to DLS’13 #30. The issues are twofold. Firstly, these models centre on the creation of clearings within predominantly wooded habitats, whereby the pollen peaks indicating that the presence of rapidly recolonizing species such as Calluna are a byproduct (intentional or otherwise) of repeated burning (Mallik and Gimingham 1983). To reiterate, the palaeoenvironmental evidence from DLS’13 #30 represents burning of an area of heathland rather than an area of woodland. Secondly, such models focus on the presence of ‘big game’ species. There is currently no definitive zooarchaeological evidence for the presence of large terrestrial ungulates in the Mesolithic of the Western Isles. The natural expansion of heathland communities in the Uists has largely been attributed to “progressive soil deterioration” in the absence of substantial woodland, due to the climatically marginal nature of these island landscapes (Mulder 1999:276–278), a phenomenon observed in other island systems in the wider North Atlantic, such as the Faroes (Lawson et al 2007). Accordingly, a hypothesis for a natural cause of fire at DLS’13 #30 must also be investigated. Peterken (1996) and Brown (1997) have argued that heathland species, including heather and gorse, are more susceptible to natural fires such as those caused by lightning strike. Climatic instability and high natural fire frequency during very dry periods of the early Holocene is often postulated as an explanation for elevated charcoal levels in palaeoenvironmental records of north-west Europe (Brown 1997:136, Huntley 1993, Tipping 1996). The dating evidence from the charred material from DLS’13 #30 accords with a period of abrupt climatic changes that oscillate between cool and wet to warm and dry, as exemplified in the pollen and charcoal records from numerous sites in mainland Scotland and the Hebrides (Tipping 1996, Tipping and Milburn 2000, Tipping et al. 2008). Although summertime temperatures during these warmer periods may have been as little as 1° C above present, models have indicated that even such an insignificant rise in temperature, when coupled with a dramatic fall in precipitation, can have marked effects on vegetative composition and its susceptibility to disturbance (Briffa and Atkinson 1997:108, Moore 2000, Overpeck et al. 1990). Light surface fires of ground-level vegetation are a frequent part of natural fire dynamics for example, and evidence from the Scottish Highlands indicates a direct correlation between heathland expansion and natural fire incidence that may have been exploited by hunter-gatherer communities (Bradshaw et al. 1997, Froyd 2006, Moore 2000). Consequently, supporting evidence for significant human impact on the environment in the Mesolithic of Lewis is challenging to interpret. Low levels of charcoal and woodland decline at Loch Builaval Beag were interpreted as indicative of natural, climatic change (Fossitt 1996:188), similarly the evidence from Loch na Beinne Bige does not attest to significant anthropogenic disturbance of the environment, only the possiblity of small, local fires (Lomax 1997:240, 265). Only the medium levels of charcoal abundance at Callanish-3 have been interpreted as anthropogenic in origin (Bohncke 1988). It should be noted however, that light surface fires are also the most frequently created fires by humans, therefore distinguishing between an anthropogenic or natural cause is highly problematic without very fine-resolution sampling (Moore 1996, 2000). Therefore, having rehearsed the various interpretive models for existence of the carbonised material, we believe that the open heathland landscape within the vicinity of the site is likely a result of natural causes. The distinctive composition of the charred palaeoenvironmental assemblage from DLS’13 #30 suggests that it most probably derives from anthropogenic activities within the river catchment, such as burning heather and turf as a fuel within a hearth, rather than evidence of a natural fire or ‘catastrophic’ and deliberate large-scale fire strategy for the purposes of managing heathland resources. Evaluating river-focused archaeological field survey The methodology employed in the survey along the river was successful in identifying Mesolithic-age deposits, within the geomorphic position predicted, on the basis of the stratigraphic position of other Mesolithic sites identified as part of coastal erosion surveys in the region. Although the method did not produce definite evidence of Mesolithic human settlement, the investigation has shown the potential of the method for identifying Mesolithic sites in the interior of the Western Isles. However, there are potential challenges in identifying archaeological sites of Mesolithic date in the region using this approach. The geomorphological processes and environmental changes that have occurred on Lewis since the mid-Holocene have greatly altered the landscape. Though the low-energy lowland and perimarine river systems of the Barabhais region in Lewis are likely to have been relatively stable (Howard and Macklin 1999), they will have certainly seen some change: sea level rise since the Mesolithic period will have altered the water table and consequently drainage patterns (Howard and Macklin 1999, Woodman 1997:370). Furthermore, it cannot be readily assumed that the heavily managed modern rivers in the region, which are maintained to support angling tourism, were comparable to Mesolithic river systems (Warren 2005:56). Overcoming this issue would require extensive modelling of relic river systems that incorporate multi-proxy approaches by fluvial geomorphologists to date sedimentation rates of relic beds, and reconstruct alterations in watercourses and floodplain environments (Brown 2003, Brown et al. 2016, Howard and Macklin 1999, Macklin et al. 2010, Woodman 1997:370). In addition to the natural barriers that have hampered these types of investigation, theoretical hurdles must also be overcome. Investigations in Britain and Norway have demonstrated that evidence for Mesolithic occupation is closely associated with watercourses (Bang-Andersen 2003, Boaz 1998, Donahue and Lovis 2003, Edwards et al. 1983, Persson 2009, Ward 2010). The methodology described in this paper to predict the locations of Mesolithic sites is based on the long-standing view that Mesolithic mobility encompassed regular movements between coastal and inland regions, whether residential moves of the whole group (Clark 1972), logistic forays by specialist task-groups (Binford 1980), or a more complex mobility pattern combining both models, such as has been proposed for the Mesolithic occupation of the Pennines (Donahue and Lovis 2006). These ethnographically derived models and their application to the archaeological record have been criticised as creating a coast-inland dichotomy that has pervaded, unimpeded, over interpretations of Mesolithic sites in Britain (Preston 2013, Spikins 2000). Even so, models such as Spikins’ Social Territories Model (1996) and the Pennine Nexus Hypothesis (Preston 2013), formulated as alternatives, are restrictive in their application as both are tied to river networks. The data therefore becomes part of a hermeneutic cycle: sites are found by rivers, therefore models are created based on these data; surveys are conducted based on this model, which in turn result in further data that reinforce the model. Warren (2005:64–65) has criticised the neglect by archaeologists of over-land routes as likely means of movement through the landscape, stating that the Holocene woodland has been characterised as “dark and impenetrable: overgrown, foreboding places .…” This is despite evidence from the Tweed valleys in south-east Scotland which indicates Mesolithic settlements were situated away from the coast and rivers (Warren 2005:141). Further work investigating the interior of the Western Isles must therefore heed such warnings, whilst it must be understood that in the absence of any other suitable method of investigation, successful implementation of the river-survey methodology will only continue to support this bias. Conclusion The charred remains from DLS’13 #30 represent evidence for burning of Calluna heathland that is situated within the catchment of Gleann Mor Barabhais in the interior of Lewis during the Late Mesolithic. It is likely that a degree of aggregate landscape instability caused the charred material to be eroded from its original location and incorporated within flood deposits further downstream. There are three different hypotheses which could explain the presence of the charred palaeobotanical material at DLS’13 #30: 1)	the material represents small-scale burning of turf or heather fuel in an anthropogenic setting, such as a domestic hearth; 2)	the material represents deliberate land management strategies by Mesolithic people in order to maintain heathland with the purpose of manipulating floral resources by way of fire ecology; 3)	the material represents a natural event, such as fire by lightning strike. Based on the evidence, it is not possible to ascertain whether the charred plant remains from DLS’3 #30 derive from anthropogenic interference such as domestic hearth material, rather than active vegetation clearance (Edwards 1990:77, Simmons 1996:158), or a landscape fire resulting from deliberate land-management strategies (Edwards 1990, 1996; Jacobi et al. 1976; Tallis and Switsur 1990). It is also possible that the fire in the landscape is simply a natural occurrence (Tipping 1996). However, given the relatively small quantity of the carbonised material recovered and that the assemblage resembles charred fuel remnants recovered from other archaeological sites in the North Atlantic region, the authors favour the first interpretation. The methodology employed in the survey along the river, which was based upon investigations of eroding river banks in Britain in order to identify Mesolithic sites, was successful in identifying Mesolithic-age deposits. Although the sampling did not yield definitive evidence for Mesolithic human occupation, it is hoped that future investigation of the interior will reveal Mesolithic remains, despite the present difficulties of investigation.